UPPSC APO Vacancy 2019 Application is invited to fill 580 posts of assistant prosecution officer with 370 UPPSC BDO Recruitment. Total 900 vacancies are reserved in UP APO BDO (Block Development Officer). 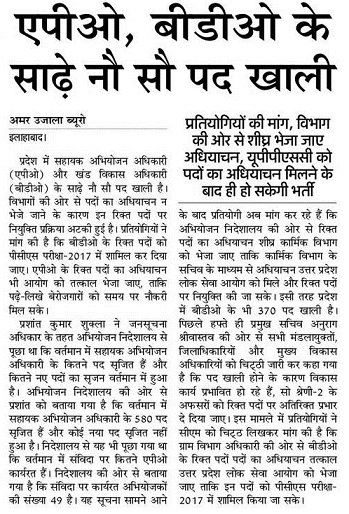 UP Government in a talk with Uttar Public service commission for conducting written exam & Interview and candidates will soon able to apply for both posts in eligibility criteria of (APO) LAW and (BDO) Graduate pass in any stream. UPPSC APO Latest News 2019: Visible up to 02/05/2019 notice regarding assistant prosecution officer Exam 2019. Rit yachika 1 April 2019 43 candidates name list according to merit. 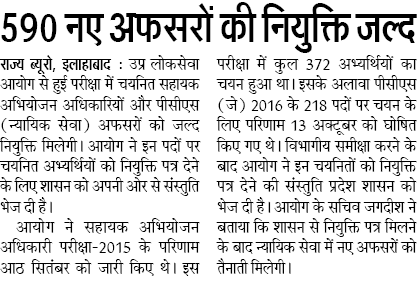 Sahayak Abhiyojan Adhikari Latest News: UPPSC going to add 17 more posts in 372 vacancies of APO (Assistant Prosecution Officer). On 27 January this update also confirm that online registration will also come in future of UP APO Upcoming Vacancy 2019-20. UPPSC Assistant Prosecution Officer Recruitment 2018: Latest News 3.11.2017 590 Sahayak Abhiyojan Adhikari soon get joining letter. Applicant who passed in 2015 (372 selected), 2016 (216 posts) has said to release appointment letter of 590 APO as soon as possible. Total Number of Vacancies: 900 posts. 1.The exam question is of multiple type objectives i.e. it consists of 4 Questions. 3.Each paper is conducted for a total of 400 Marks. 4.Duration of each paper is 2 Hours. 5.Candidates who will qualify in this exam called for Interview. Age limit: Candidates applying for the post should 21 years and must not have crossed the age of 40 years on July 1, 2018 date of submission of application. Educational Qualification: Degree in law from the recognized University. Salary: Rupees 9300/- + Grade Pay Rs.`4600/- + DA applicable on the date of offer of appointment. 1. Unreserved (General) and Other Backward Class: Rs. 100/- + On-line processing fee Rs. 25/- Total Rs. 125/-. 2. Scheduled Caste, Scheduled Tribe: Rs. 40/- + On-line processing fee Rs. 25/- Total = Rs. 65/-.